Katy is a lecturer in the Department of Engineering on the Sports Engineering degree. She has expertise in the areas of Paralympic/disability sport, human performance, and exercise and environmental physiology. Katy is the module leader for the Experimental Biomechanics and Physiology module. Katy’s career to date has been in the field of exercise physiology, particularly in the areas of human health and performance, in both able-bodied and disability sport. 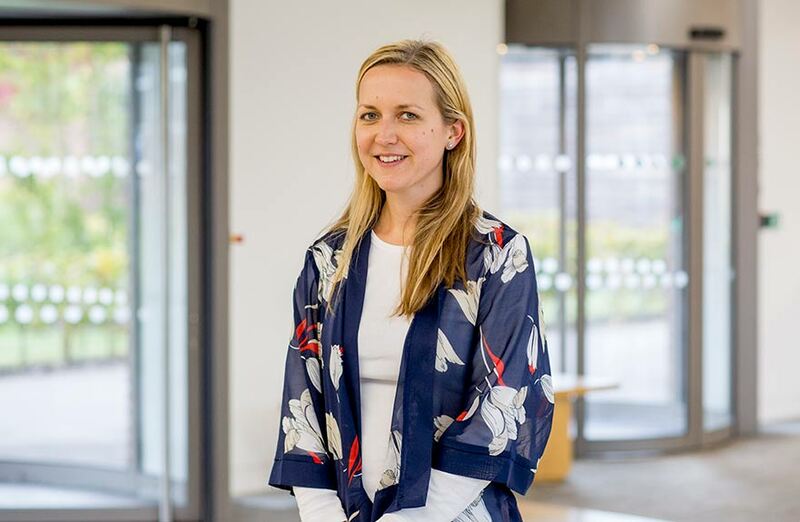 Katy undertook a BSc (Hons) in Sport and Exercise Science at Bath University, during which, as part of an industrial placement, she worked for the Army Recruiting and Training division (MoD) conducting research to reduce injury and illness in initial recruit training. She then went to Loughborough University to complete an MSc in Exercise Physiology before moving departments to become a researcher for the Environmental Ergonomics Research Centre. During this role, she worked on an EU funded project, which aimed to develop personal protective clothing with an integration monitoring system to detect heat stress. Following which, she embarked on a PhD with the Peter Harrison Centre for Disability Sport (Loughborough University) investigating the thermoregulatory responses of athletes with a spinal cord injury. Alongside her PhD she worked as a researcher providing sport science support to a number of Paralympic squads. On the completion of her PhD, she returned to the Environmental Ergonomics Research Centre, working on a number of research projects with industrial partners, such as Adidas and Nissan. Her previous role, before moving to Nottingham Trent University, was at Oxford Brookes University as a Lecturer in Sport and Exercise Science. Katy’s research focuses on the areas of human health, performance and disability sport. Her work to date has investigated the physiological effect of the environment on both occupational and sporting performance in both the able-bodied and individuals with a disability. Her work focuses on the application of interventions to improve sporting and human performance, with a particular emphasis on human performance in the heat. She is also interested in the physiological and ergonomic impact of technology, clothing and equipment on human performance. Katy is a reviewer for a number of international publications in her field, including International Journal of Sports Physiology and Performance, Ergonomics, Journal of Science and Medicine in Sport, Journal of Sports Sciences and Journal of Spinal Cord Medicine. Gerrett, N., Griggs, K., Redortier, B., Voelcker, T., Kondo, N. and Havenith, G. (2018). Sweat-from gland to skin surface – production, transport and skin absorption. Journal of Applied Physiology, 125 (2), 459-469. Griggs, K.E., Havenith, G., Paulson, T.A., Price, M.J. and Goosey-Tolfrey, V.L. (2017). Effects of cooling before and during simulated match play on thermoregulatory responses of athletes with tetraplegia. Journal of Science and Medicine in Sport, 20, 819-824. Griggs, K.E., Havenith, G., Price, M.J., Mason, B.S. and Goosey-Tolfrey, V.L. (2017). Thermoregulatory responses during competitive wheelchair rugby match play. International Journal of Sports Medicine, 38(03), 177-183. Griggs, K., Goosey-Tolfrey, V.L. and Paulson, T. (2017). Supporting Paralympic wheelchair sport performance through technological, physiological and environmental considerations. Annals of Human Biology. 44 (4), 295-296. Richmond, V.L., Davey, S., Griggs, K. and Havenith, G. (2015). Prediction of Core Body Temperature from Multiple Variables. Annals of Occupational Hygiene. 59 (9), 1168-1178. Griggs, K.E., Price, M.J. and Goosey-Tolfrey, V.L. (2015). Cooling athletes with a spinal cord injury. Sports Medicine. 45(1), 9-21. Griggs, K.E., Havenith, G., Paulson, T., Price, M. and Goosey-Tolfrey, V.L. (2015). Effectiveness of pre-cooling and cooling during play on wheelchair rugby performance. Extreme Physiology and Medicine. 4 (Suppl 1), A4. Yoda, T., Griggs, K.E., Leicht, C.A. and Goosey-Tolfrey, V.L. (2015). The effect of increased ambient temperature on thermoregulatory responses in spinal cord injured people. Extreme Physiology and Medicine. 4 (Suppl 1), A157. Leicht, C.A., Griggs, K.E., Lavin, J., Tolfrey, K. and Goosey-Tolfrey, V.L. (2014). Blood lactate and ventilatory thresholds in wheelchair athletes with tetraplegia and paraplegia. European Journal of Applied Physiology. 114(8),1635-43. Havenith, G., Richmond, V.L., Davey S., Griggs, K.E. and Rayson, M. (2014). Prediction of rectal temperature from non-invasive variables. Medicine and Science in Sports and Exercise. 46(5), 185-186. Leicht, C.A., Bishop, N.C., Paulson, T.A.W., Griggs, K.E. and Goosey-Tolfrey, V.L. (2012) Salivary immunoglobulin A and upper respiratory symptoms during five months of training in elite tetraplegic athletes. International Journal of Sports Physiology and Performance.7, 210-217. Griggs, K.E., Bilzon, J.L.J., Wilkinson, D.M., Richmond, V.L. and Rayson, M.P. (2008). Direct versus Indirect Prediction of Prolonged Loaded-March Performance. Medicine and Science in Sports and Exercise. 40(5), S46. Horner, F.E., Rayson,M.P., Wilkinson, D.M., Carter, J.M., Richmond, V.L., Griggs, K.E. and Gilbert, K.L. (2008). Reliability and Validity of the 3dNX Accelerometer during Treadmill Exercise. Medicine and Science in Sports and Exercise. 40(5), S208.